Xanax is a short-acting, orally-ingested benzodiazepine and is currently the single most prescribed psychiatric medication in the US. It is primarily used in the treatment of people with anxiety, including generalized anxiety disorder and panic disorder. Xanax works by acting on the brain and nervous system, promoting sedation and muscle relaxation, thus producing a calming effect. The main chemical targeted by Xanax, is GABA. GABA is the body’s main neurotransmitter responsible for relaxation. Thus, Xanax promotes the increased production of GABA, resulting in a sense of relaxation. 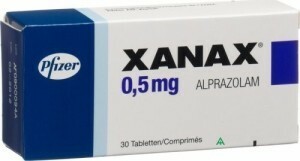 Xanax has a short half life, meaning the effects of it are rapidly felt, sometimes within minutes, thus making Xanax an extremely addictive medication. Xanax is available via prescription from a doctor as it is a potent drug, which can result in addiction and withdrawal symptoms if not taken carefully. Thus, it is important that Xanax is never taken without the care of a medical professional. Like Xanax, Ativan is also an orally-ingested benzodiazepine primarily used in the treatment of anxiety to promote relaxation and sedation. Furthermore, Ativan also works by enhancing the effects of the GABA neurotransmitters. Ativan may cause withdrawal reactions, specifically if an individual has taken this medication for a long period of time or at a high dosage. Consequently, this medication might result in drug-seeking behaviour, or addiction. How Do These Drugs Differ? Xanax and Ativan are both benzodiazepines that are similar in potency. Although both medications can be used to treat anxiety, their primary uses differ slightly: Ativan is used to treat anxiety and as a preoperative sedative, and Xanax is used to treat anxiety and panic disorder. Furthermore, although both Ativan and Xanax are short acting medications, their action times are slightly difference. That is, there is a distinct difference in the amount of time that the drugs are active within the body, or how long the drug effects last. Typically, it takes Ativan 1-6 hours to peak, with an average half life of 14-15 hours. Contrastingly, Xanax takes 1-2 hours to peak, with an average half life of 11-12 hours. In addition to these differences, there are also differences between the addictive qualities of the two drugs. Although chronic use of any benzodiazepine can result in dependence/addiction. Another significant difference between these two medications are the clients they can be prescribed to. While Ativan can be prescribed to children as young as 12 years, Xanax is only approved for use with adults over the age of 18. The side effects of both Ativan and Xanax also differ slightly. The side effects of taking Xanax include drowsiness, dizziness, memory problems, poor balance, slurred speech, difficulties concentrating, headaches, blurred vision, changes in appetite, and irritability. Contrastingly, the side effects of taking Ativan include confusion, depressed mood, suicidal ideations, hostility, hyperactivity, hallucinations, blurred vision, feeling light headed, and sleep problems. Emily Habelrih. "Difference Between Xanax and Ativan." DifferenceBetween.net. August 2, 2016 < http://www.differencebetween.net/science/health/drugs-health/difference-between-xanax-and-ativan/ >.